Belhaven University is a Christian liberal arts college dedicated to helping people grapple with the complex issues of life and to preparing them for positions of leadership in a rapidly changing society. A community of professors and students working together in a Christian environment, Belhaven emphasizes the importance of the individual. In addition to a strong traditional liberal arts program, Belhaven provides an atmosphere in which students can find purpose and meaning in life. Academic preparation and Christian experience go hand in hand at Belhaven. Read more about Belhaven's profile (PDF). Each student is encouraged to develop and grow to the best of his or her potential and to face the future with confidence and determination. Interwoven into academic preparation is a curriculum that emphasizes personal values and constructive attitudes toward work, other people, and the quality of life. Belhaven strives for excellence in higher education. The College is dedicated to the belief that only the Christian liberal arts institution can educate men and women capable of totally purposeful action and direction. Belhaven University, has a rich heritage of prominence in education dating back to 1883. In addition to traditional majors, programs of general studies are available. There are also pre-professional and certificate programs, as well as graduate degree programs. Belhaven University has a long and productive history of relationship with the Presbyterian Church. 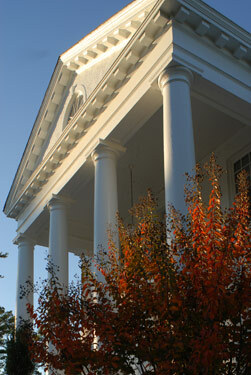 Until 1972, the College was owned and operated by the Synod of Mississippi, Presbyterian Church in the United States, through a Synod-elected board of trustees. In 1972, the Synod gave ownership of the College to a self-perpetuating board of trustees. The College has a covenant relationship with the Synod of Living Waters of the Presbyterian Church (U.S.A.) and seeks to deepen its relationship with various other Presbyterian bodies. Faculty and staff members are drawn from various denominations, with the primary Presbyterian denominations represented being the Presbyterian Church (U.S.A.), the Presbyterian Church in America, and the Evangelical Presbyterian Church. The College receives both financial support and students from these three denominations. Belhaven also provides Federal Government Required Consumer Information. Belhaven University is a Mississippi nonprofit corporation, recognized by the Internal Revenue Service as a 501(c)(3) corporation. Mississippi is known for its southern hospitality, sweet tea and magnolia trees, but it is also a state of many firsts in music, art and medicine. The first ever heart, lung and kidney transplant was performed by Mississippian Dr. James Hardy. Another Mississippi physician, Dr. Hannah Gay, was named to the TIME Magazine 100 list for her groundbreaking functional cure of an infant with HIV. No other state in the country can claim as many honored, awarded and revered writers such as William Faulkner, John Grisham, Tennessee Williams, Natasha Trethewey, Willie Morris and Eudora Welty. Mississippi is the birthplace of the blues. From famous musicians like Elvis Presley, BB King and Faith Hill to talented actors and directors like Jim Henson, Morgan Freeman and Oprah Winfrey all claim Mississippi as their home. Legendary football heroes Jerry Rice, Brett Favre, Walter Payton and Archie Manning lived in and loved this state. Jackson, Mississippi hosts the prestigious International Ballet Competition (IBC) rotating between the prominent cities of Helsinki, Finland; Varna, Bulgaria; and Moscow, Russia. Every part of Mississippi is a treasure and a new adventure waiting to be explored. Mississippi has everything from cultural activities, food and shopping to outdoor activities, music and entertainment. Jackson is in the heart of Mississippi and is home to some of the state’s best shopping, restaurants, museums, entertainment and events. The Fondren Arts District, Mississippi Museum of Art, Mississippi Civil Rights Museum, Museum of Mississippi History, Mississippi Children's Museum, Mississippi Museum of Natural Science, Mississippi Sports Hall of Fame and Museum, Mississippi Agricultural Museum, The Jackson Zoo, Mississippi Symphony Orchestra, Mississippi Opera, New Stage Theatre, Ballet Magnificat, Ballet Mississippi and Downtown Jackson are the perfect places to see what Jackson has to offer. The capital city is also in the perfect proximity for day trips to Memphis, New Orleans and other cities. Mississippi is brimming with places to see, things to do and events to attend and is at the forefront of thriving business, cultural diversity, historic significance and entertainment. Visit Mississippi, Believe It! for more information about our beautiful state. Belhaven University is located on a forty-two acre site near the heart of Jackson, the capital and largest city in Mississippi. Jackson, a growing center of industry, commerce, culture, and the arts, has expanded in population from 7,000 at the beginning of the century to a major metropolitan area encompassing about 400,000 individuals. Jackson prides itself on its residential areas, its impressive state and city office buildings, its spacious parks, and its progressive spirit. The Belhaven University offices for adult and graduate programs are located in the LeFleur building at 4780 I-55 North, Suite 125, Jackson, MS 39211. In addition, many evening classes are held at this location. However, all MAT, MED, and MPA classes are located on the traditional Belhaven Campus at 1500 Peachtree Street, Jackson, MS 39202. Learn more about Jackson, Mississippi. Directions: How do I get to Belhaven? From Jackson Airport take I-20 west to Jackson, MS. Then take I-55 north to Jackson, MS. Take the Woodrow Wilson Street exit (Exit 98) and turn left at the second light onto State Street. Turn left onto Pinehurst Street which will be just past First Presbyterian Church. Just a few blocks ahead the campus will be on your left. At the stop sign at Olive Street turn left into the parking lot. You can park in the Visitor Parking Circle in front of the student center. The Admission Office is located on the 2nd floor of the student center. From Memphis take I-55 south to Jackson, MS. Take the Woodrow Wilson Street exit (Exit 98) and turn left at the second light onto State Street. Turn left onto Pinehurst Street which will be just past First Presbyterian Church. Just a few blocks ahead the campus will be on your left. At the stop sign at Olive Street turn left into the parking lot. You can park in the Visitor Parking Circle in front of the student center. The Admission Office is located on the 2nd floor of the student center. From New Orleans, LA take I-55 north to Jackson, MS. Take the Woodrow Wilson Street exit (Exit 98) and turn left at the second light onto State Street. Turn left onto Pinehurst Street which will be just past First Presbyterian Church. Just a few blocks ahead the campus will be on your left. At the stop sign at Olive Street turn left into the parking lot. You can park in the Visitor Parking Circle in front of the student center. The Admission Office is located on the 2nd floor of the student center. From Birmingham, AL take I-20 west to Jackson, MS. Then take I-55 north to Jackson, MS. Take the Woodrow Wilson Street exit (Exit 98) and turn left at the second light onto State Street. Turn left onto Pinehurst Street which will be just past First Presbyterian Church. Just a few blocks ahead the campus will be on your left. At the stop sign at Olive Street turn left into the parking lot. You can park in the Visitor Parking Circle in front of the student center. The Admission Office is located on the 2nd floor of the student center. From Dallas, TX take I-20 east to Jackson, MS. Then take I-55 north to Jackson, MS. Take the Woodrow Wilson Street exit (Exit 98) and turn left at the second light onto State Street. Turn left onto Pinehurst Street which will be just past First Presbyterian Church. Just a few blocks ahead the campus will be on your left. At the stop sign at Olive Street turn left into the parking lot. You can park in the Visitor Parking Circle in front of the student center. The Admission Office is located on the 2nd floor of the student center. Located in a historical residential neighborhood, the Belhaven campus provides a pleasing setting for learning and growth. 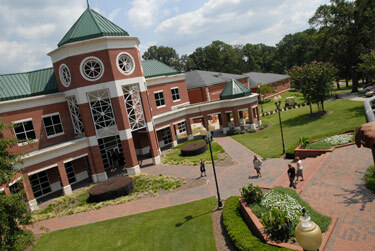 The campus combines the best of traditional southern architecture with contemporary utilization of space. We enjoy the resources and benefits of having our campus in a historic neighborhood and state capital urban area. It is vital that Belhaven University’s campus be a safe place for students to study and live, and we go to great lengths to assure multiple layers of safety measures are in place. Take the Virtual Tour of our campus to get more of the flavor of Belhaven University. Want to have beautiful photos of Belhaven University set as your screen saver? Download screensaver instructions for MAC and PC (PDF). Download the photos (ZIP).